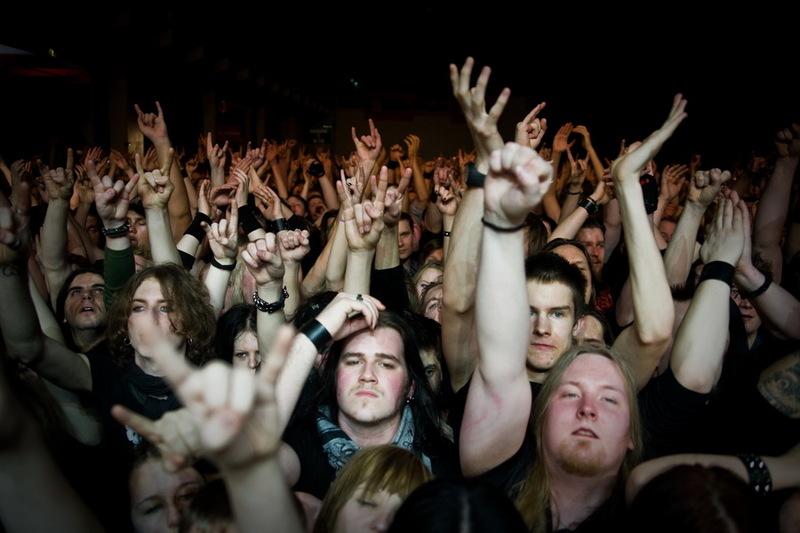 In the darkest and coldest winter days of Finland (well, usually cold) metalheads gather for the annual FME for the wonders of music business. 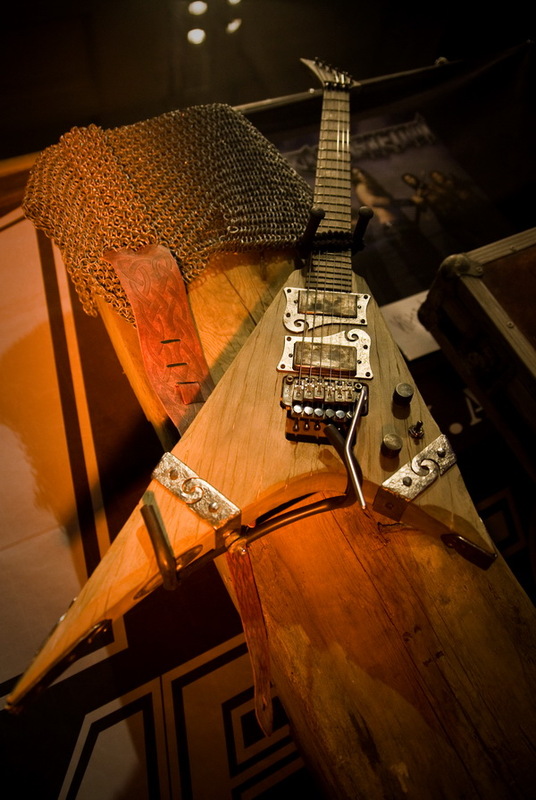 Now organized for the fourth time, the Metal Expo was again a success with it's concerts, clinics, merchandise stands, signing sessions, anything you could imagine, with 5000 visitors in two days. Since we're in Finland the band line-up was heavier than hard rock. 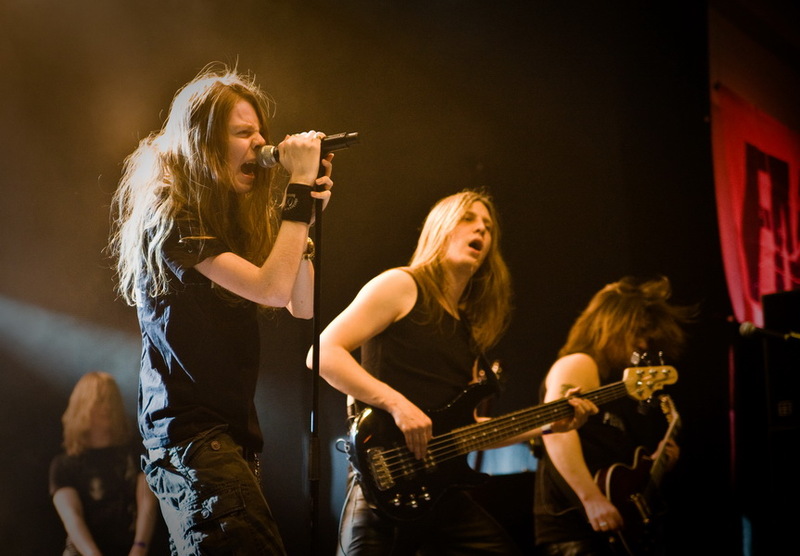 There were only two bands you could count on playing traditional melodic metal, the Finnish Idols-sensation Ari Koivunen and Ancara. 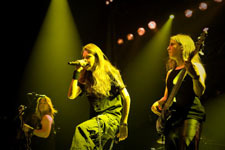 AMBERIAN DAWN brought some female touch to the event with their symphonic power metal with classical features. 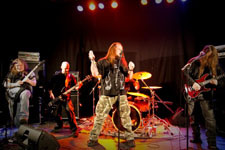 Most bands from the rest of the line-up have been seen on too many Finnish events lately, but probably fit in the profile of todays metalfans. This was a reason I wasn't too excited about this year, with all the grindcore, deathmetal, folkmetal and whatnot acts. It was just too much brutal metal in one package, making it hard to hand le. 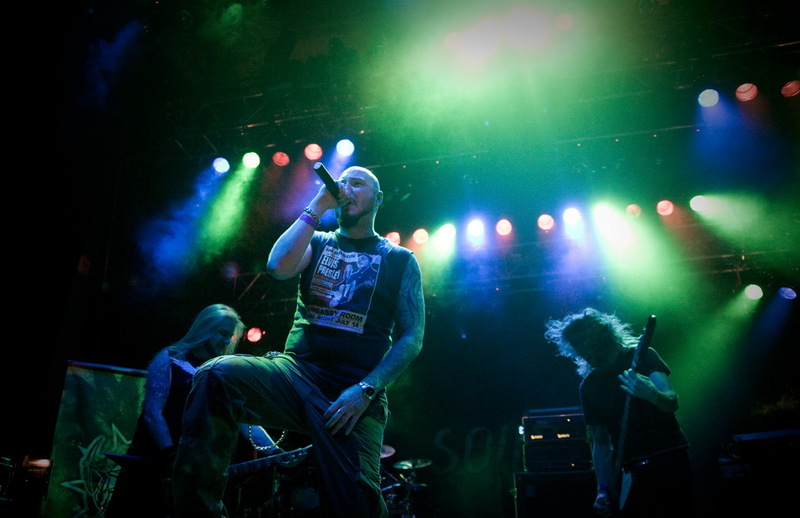 This years biggest bands were SOILWORK (SWE), Turisas, Municipal Waste (USA), Mustasch (SWE), KORPIKLAANI and STAM1NA. Friday kicked off with SOTAJUMALA, DISCARD, Municipal Waste and an all-star band ROCK (Anssi Kippo, Sami Vauhkonen, Heikki Pöyhiä, Tone Pulkkinen, Toni Paananen), which I would've wanted to see. CAUSE FOR EFFECT played several sets both days. 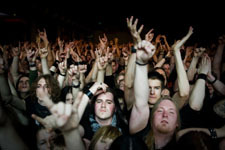 The show from MUNICIPAL WASTE, first visit in Finland, got praises from its fans, and the first-ever seen "wall of death" in Finland was an event itself. Being a veteran of pits myself I have no interest anymore to rush into them, it might get brutal and bloody, but this wall claimed no victims. 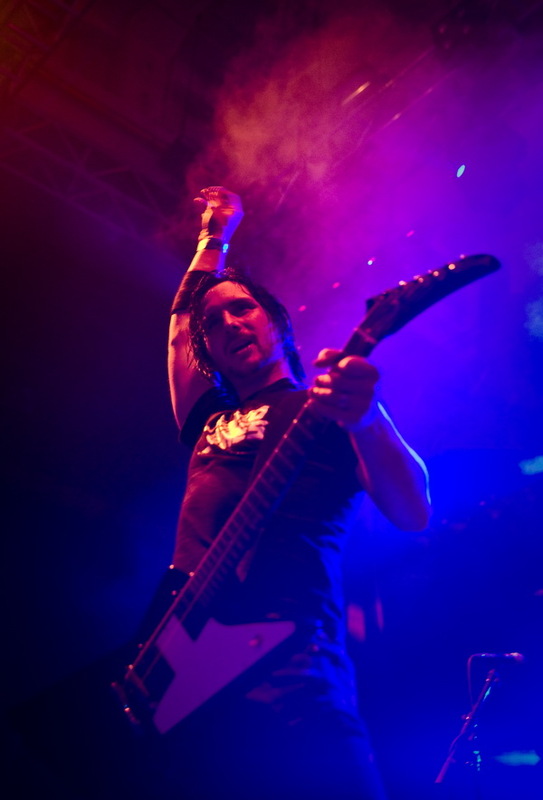 I guess I didn't miss much with ROCK either (Valssaamo stage, clinics). They seemed like a band among dozens alike, even with its stars. 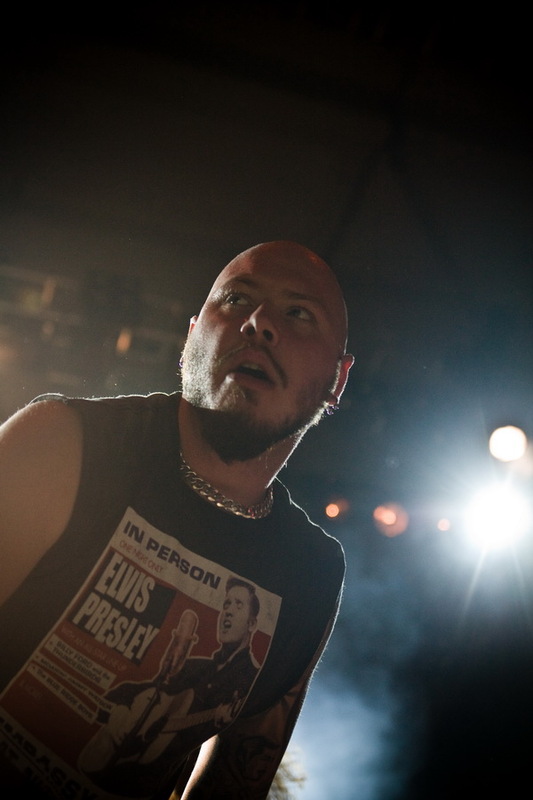 FME had brought a new idea to the event too, a songwriting workshop, where Tuomas Saukkonen (BEFORE THE DAWN) worked on a song from scratch (not really) to near finish. New ideas such as this are always welcome. 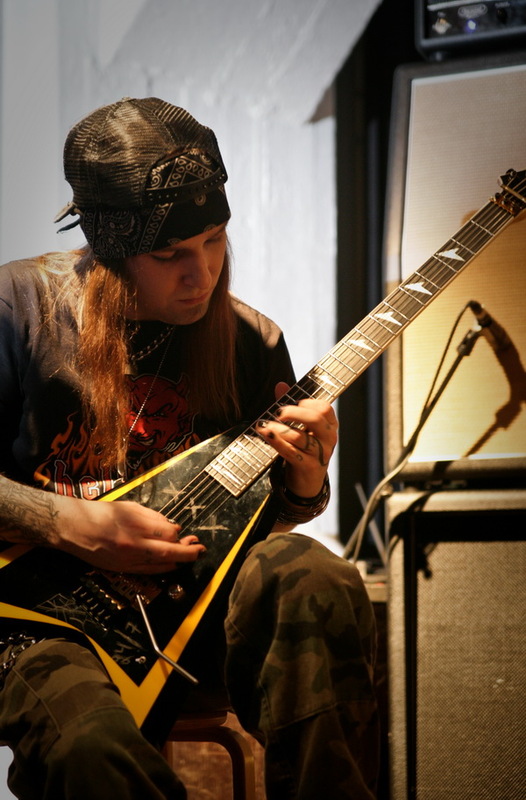 Friday also saw clinics from Matias Kupiainen, Mikko Kaakkuriniemi, Sami Yli-Sirniö & Archie69, Euge Valovirta & Atte Sarkima and Alexi Laiho & Roope Latvala, most of them regular clinic guests in FME. 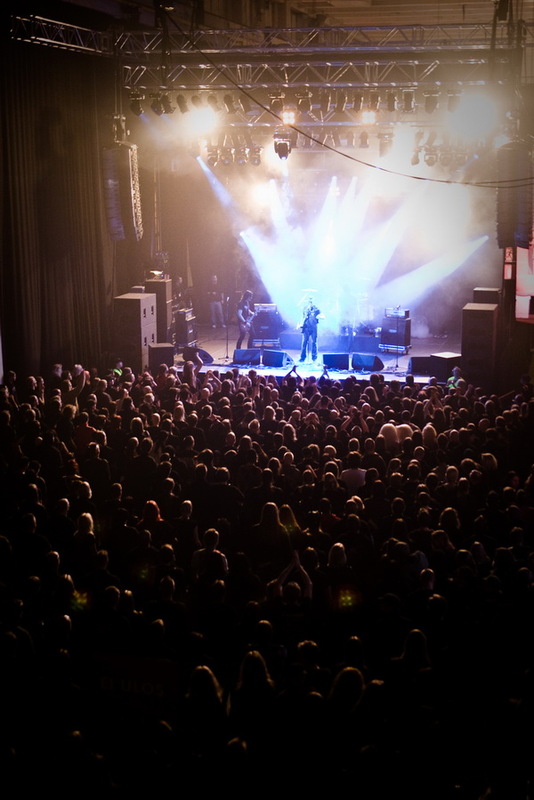 Mokoma and Nightwish have had a strong fanbase in Finland for years now, and it showed in the votes. 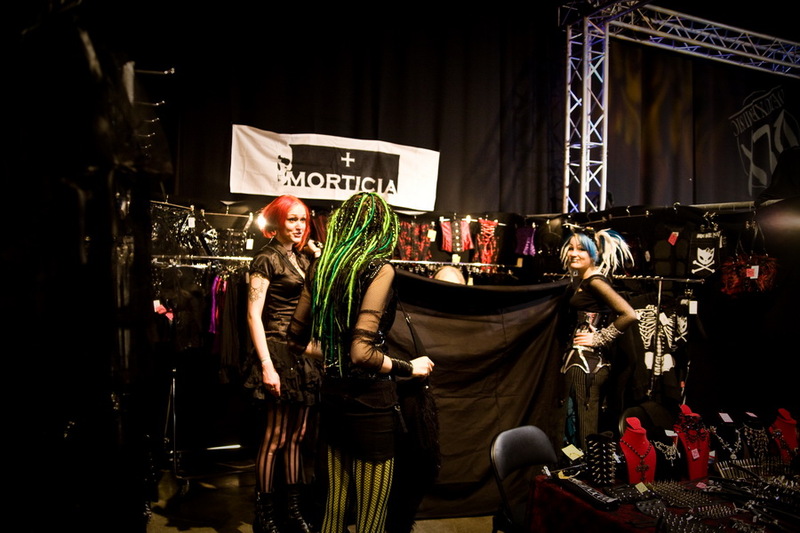 Mokoma collected the prizes last year too, and enjoyed their victory once again on stage. The only missing member was singer Marko Annala, who sent a cellphone message to the fans from home, while watching the Eurovision song contest national finals. 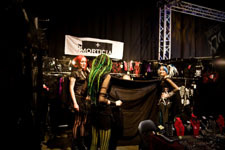 Mokoma proved to be again hilarious on stage, thanking their album covers' colour choices for winning the Cover Art Of The Year and then again naming their album pure crap after winning the Album Of The Year award. Nightwish was touring in Berlin at the time, so the awards for Holopainen and the band were picked up by Toni Peiju (King Foo Entertainment). 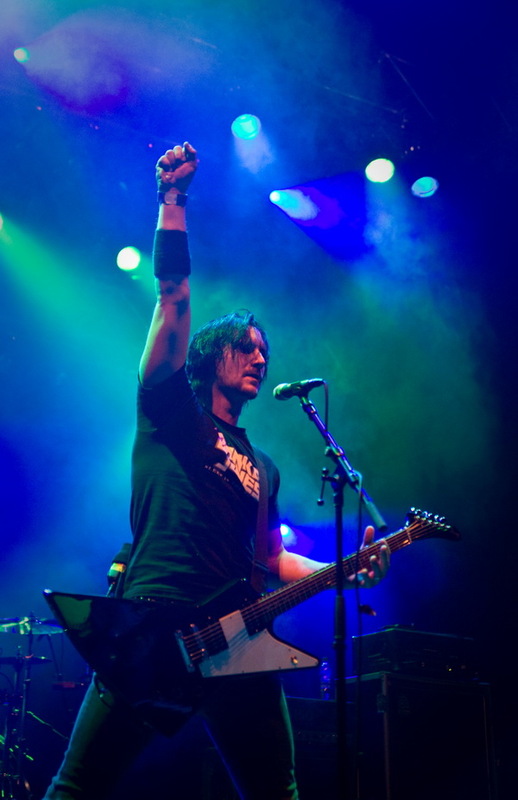 Ari Koivunen was present though, he was seen with his hood and cap on his eyes, wondering about the shouts that accompanied him on stage. His band had only few true fans here, so the noise was candy to his ears. 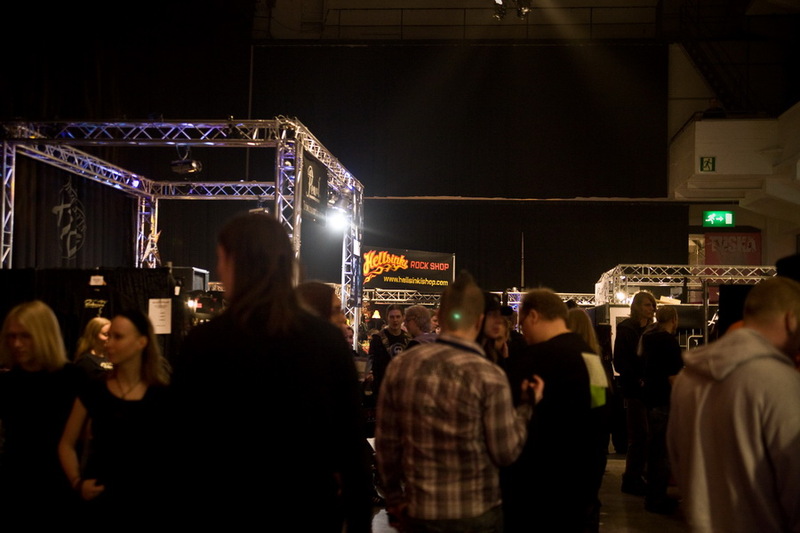 These awards were handed out by Niko Kaartinen from Imperiumi.net, who was on the FME stage for the first time. AMORPHIS reached a first ever in their career gold status with "Eclipse" and "Silent Waters", each selling 15,000 copies in Finland, so the guys were handed their gold discs in FME. 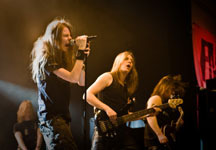 Singer Tomi Joutsen was, band members lovingly joking, "taking care of his wife at home", while the band was interviewed shortly on stage. As Esa Holopainen stated it best; “a minor occasion for the music industry, but a major achievement for us!”, it was about time they got their discs, being one of the oldest bands in Finland, who started out with black metal, then adding more melody and pure vocals giving them their success. 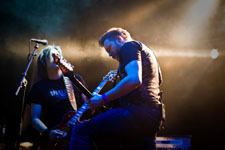 A band under TIMO KOTIPELTO's label High And Loud, ANCARA were the last to perform on the new Zodiak stage on Friday. 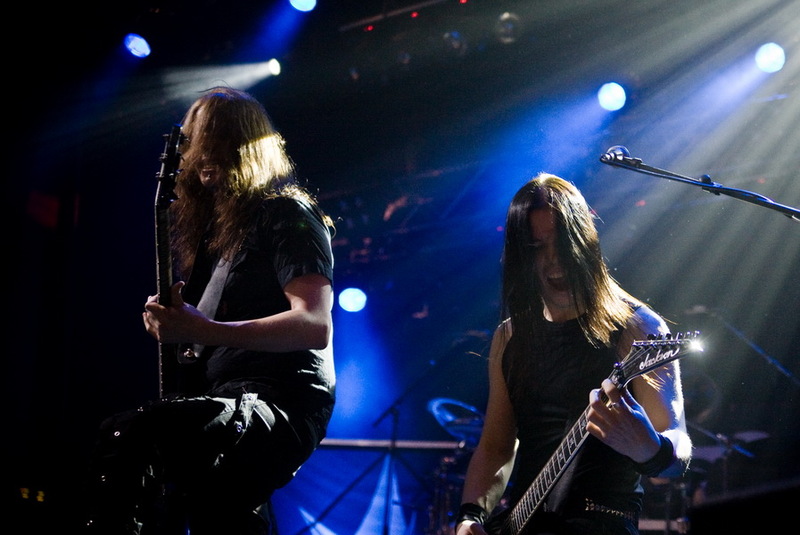 Their set was very short, around thirty minutes, and because of the overlapping schedules with the clinic from Latvala & Laiho, they had to play for only a handful of people. Of course this wasn't a place for them either, their fans were somewhere else. That didn't kill their performance though, which they could've just taken as a rehearsal, but instead decided to roam, just like their song "Bound To Roam", which was also heard, and played a finely rocking set. Vocalist Sammy Salminen made it even worthwhile for those, who weren't familiar with their songs, and entertained with his comments. "Burn In Hell" was dedicated for all future girlfriends, future ex-wives and so on. 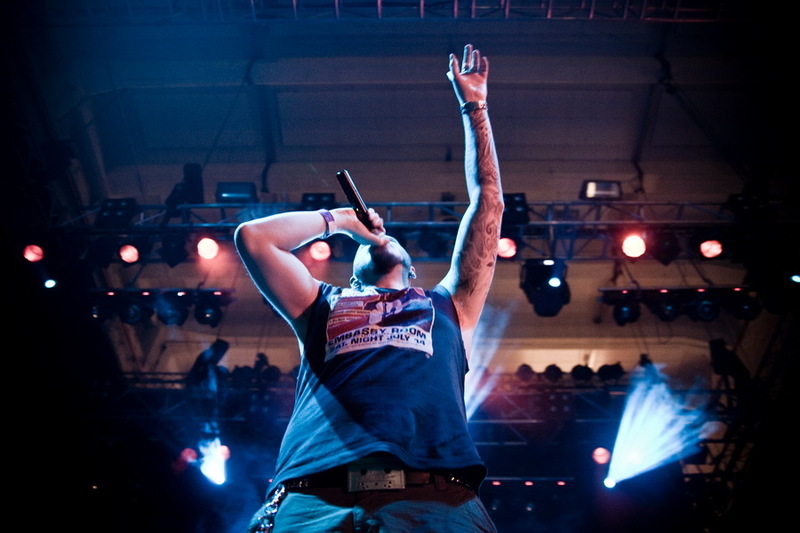 It was the heaviest song in their set, and while sort of harsh for their style, it rocked. The crowd also got to hear their hit "Deny", which has a video out, and Billy Idol -cover "Rebel Yell", a familiar part of their set played with great enthusiasm, with crunchy and eloquent guitar work from Juha Wahlsten and Samuel Hjelt, and the dynamic rhythm section Timo Rajala (drums) and Mika Rajala (bass). It was an enjoyable and intimate show, which I prefer anyhow. The main stage, Radio Rock -stage got its fourth band on stage at ten o'clock. MUSTASCH filled the venue with their slow, tormenting heavy riffs and attitude. 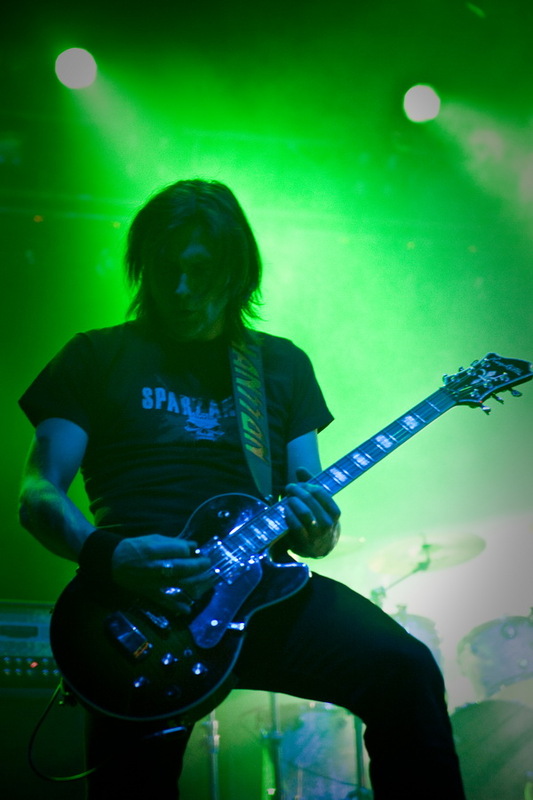 This stoner rock influenced band faced trouble on stage to begin with, and vocalist/lead guitarist Ralf Gyllenhammar didn't cope well with the situation. His ego was all over the place during the whole show, that was predicted a fast end, but the fourpiece played a satisfying and convincing set. Gyllenhammar's voice was strong and the band also sounded strong and big, and the grooves worked for the crowd not first too convinced about the act. Their jamsession was out of place though, cutting rudely what had grown into a dazing set, and all the while Gyllenhammar continued his egotistic performance, playing on top of a loudspeaker, and even showing off his manly figures. It was both a very entertaining show and a disaster, but since they after all managed to pull of a full show which the crowd liked, it was worth the confusion and money. Friday's headliner was Finnish TURISAS, who are like Gods in their homeland. A band that has fast become very popular -not just in Finland, Europe also has demand for them, were the right choice for a headliner. 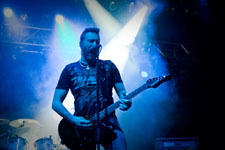 The band has toured wheels hot for a long time, more in Europe though than in Finland, so their success might be the result from that, or the success keeps them on the road. Around two years ago I was surprised seing a young schoolgirl wearing their shirt in a small dead county where I live in, where metal wasn't too visible back then, so Turisas certainly carries something others don't. 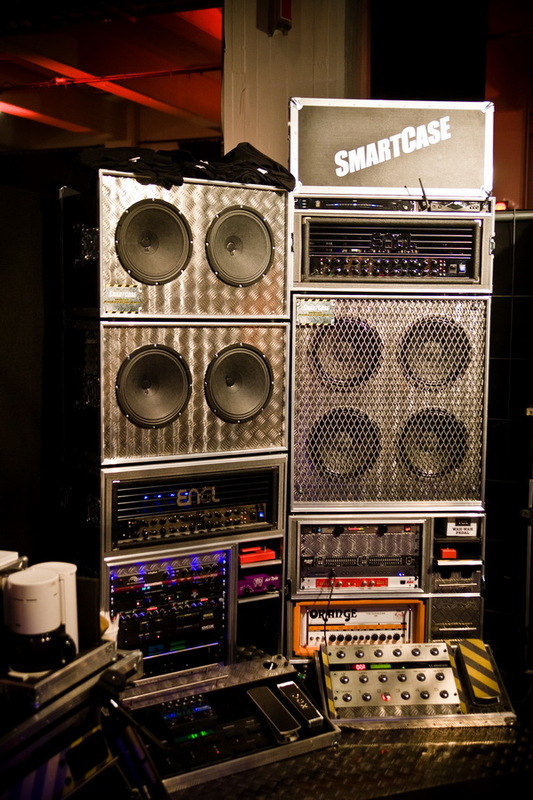 Adding an accordion to metal makes it unique of course. Netta Skog, their latest addition to the band, was at the time of FME only a replacement for Lisko Mäkinen, and her performance didn't exactly convince me in FME, but she corrected that later on in another show. 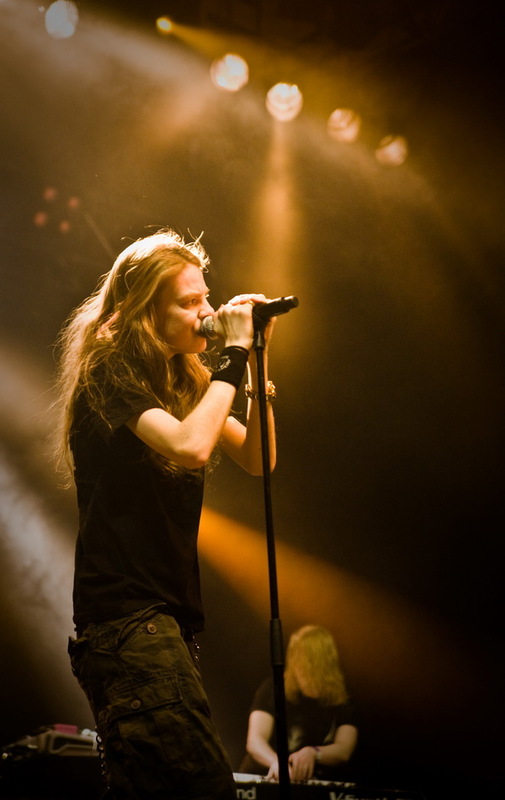 Another special addition in Turisas is a violinist, Olli Vänskä. In an hour and a half the Cable Factory turned into a hot viking party, something these barbaric metal warriors in their ancient battlefield costumes are prone to start wherever they go. 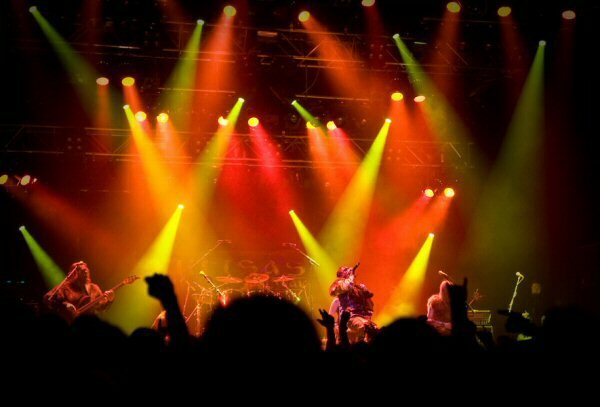 There's no excuse for not loving Turisas, live they are fascinating and very bombastic. They're a raw and powerful act with dashing pyros, great personas and an impressive lightshow, firing away all musical tinges intensively. Their shows have polka, humppa, power hymns and even Russian influences, and the crowd melts in front of these warriors. 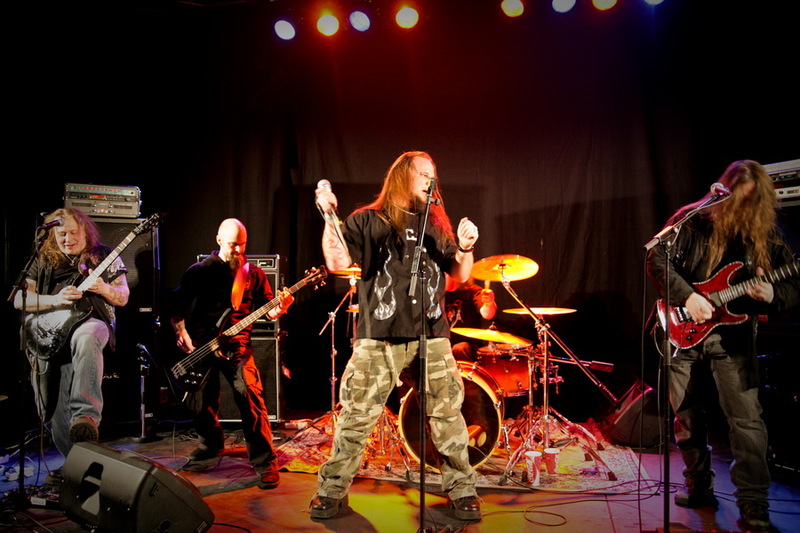 Songs from their latest album "The Varangian Way" (released 2007) were also played, with success, and the Boney M -cover "Rasputin" was another highlight, the arrangement is just wacky but powerful. These maniacs must be drinking blood for breakfast keeping the frantic spirit alive from show to another. 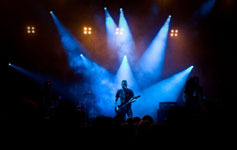 As FME didn't fully please this year, and as said before, the line-up was too heavy and dark to handle in one event, we decided to skip Saturday's KIUAS and AMBERIAN DAWN among three other bands, all unique on their own, but in one event drown to masses of similar bands. Sure they all have their own features, but in this type of metal the melancholic messages start irritating like a rash if you get an overdose. The Cable Factory was full by the time we got there in mid-afternoon, the doors opened at 2 pm, and by 5 pm people were quite drunk. The event was again missing most same things as the year earlier. The chairs were scarce, but some improvement had happened with the food at least, and smoking was only allowed in certain areas. The older music fans are much more demanding, and if these things don't work, it reduces the amount of this crowd from FME. I assumed things had probably stayed the same, so I didn't put on my most highest heels and arrived with a full stomach. Another problem was the corridor that connected the concert area to the merch stands. Anytime a band began playing people rushed from the stands to the concert area, and stuffed the corridor like rats fleeing the flood. People were really frustrated about the situation, missing the show, and almost started fights in the area. Being small I was terrified in getting in the middle, being crushed in between and stepped on. Nothing terrible happened before my eyes though, but I hope this problem will be corrected next year. Saturday's clinics saw again familiar faces; Musamaailma presented two bass clinics by Lauri Porra, guitarshow from Tuomas Wäinölä & Mikko Kosonen, more guitars from Erkka Korhonen & Luca Gargano (Ari Koivunen band) and Tuomo Saikkonen & Kuisma Aalto (Mokoma), while Levytukku had Kasperi Heikkinen (Amberian Dawn) and Mikko Kosonen showing off their guitarwork and Teppo Velin (Stam1na) doing a drum clinic. Most of the clinics were from guitarists, an instrument that fascinates people the most, apart from being a vocalist. Maybe a change for this would be good also, it would be interesting to see some more workshops from vocalists, maybe some sort of skill presentations and on-scene singing lessons at least. At five pm ARI KOIVUNEN and his band faced the very black crowd. Although the Factory was packed, the atmosphere was mostly dull, negative and immature towards Ari. 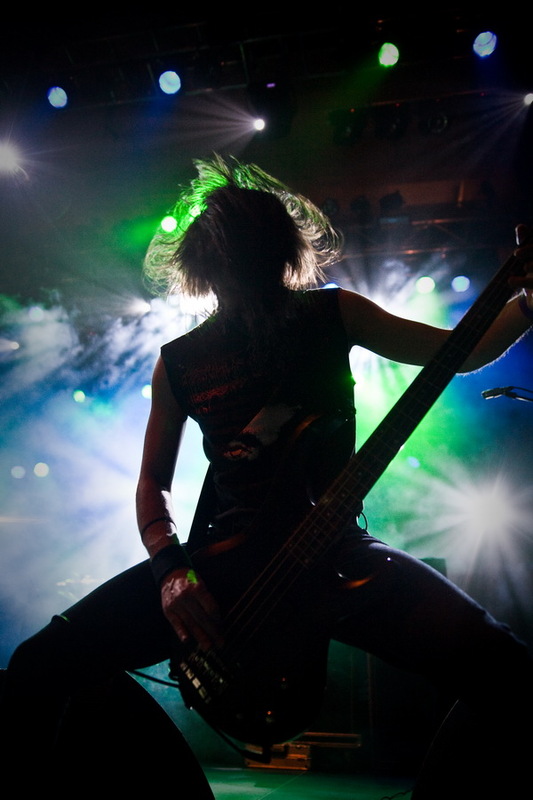 Some metal fans still can't tolerate the fact that an Idols-competition has spawned a metal singer with his own band, and the fact that a metalhead can achieve so much so easily. The emotional charge affected Ari's show from start. Since the crowd was acting up, both not giving feedback and when doing so, wrong kind of feedback, Ari seemed discouraged about it to the extent, that his attitude was also negative towards the crowd and he kept gazing to the distance and didn't show all his might as a singer and a performer. The band didn't seem to enjoy the show as much as usual either, their average fans being teenage girls, who were of course the minority in FME. Ari can well interpret some great metal singers, but this Saturday he concentrated on his own songs. 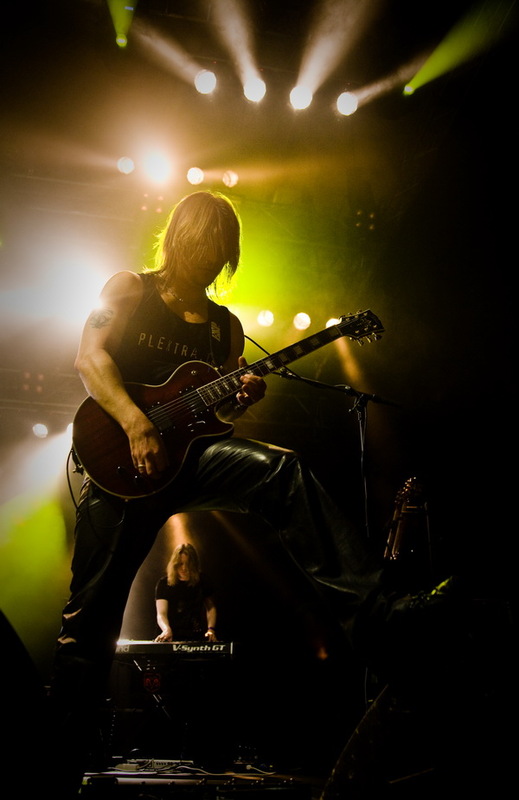 Keeping in mind that his songs were written by various Finnish musicians from bands such as THUNDERSTONE, LEVERAGE, SUB-URBAN TRIBE, STRATOVARIUS, TAROT, SONATA ARCTICA and TERÄSBETONI, the crowds reaction towards the band seemed despicable. While insulting Ari, they were also insulting their idols who wrote the songs. And being more precise, the idols of the songwriters. The 30 minute show included three songs from their second album "Becoming", released later in June after the show. The set started with "Hero's Gold" and among the new songs were also heard "Keeper's Of The Night" and "Sign Of Our Times". The response towards the new songs varied. The oldies heard were "Don't Try To Break Me" and "Our Beast". Ari's band with Erkka Korhonen (guitar), Erkki Silvennoinen (bass), Mauro Gargano (drums), Vili Robert Ollila (keys) and now ex-member Luca Gargano (guitar), played in spite of the challenge a solid melodic hard rock show, but sneaked fast off the stage with apologizing manner, Ari also passively thanking the crowd. They shouldn't apologize for nothing, every band has their barriers to break and this just wasn't the ideal crowd for Koivunen. Continuing on the shredding and mind-tearing mode, NORTHER [above, two on the right], those friendly chaps with furiously fast fingertips, caused a commotion on the scene. Even with as much gigging as they've done, majority of the gigs played abroad lately though, the interest towards them hasn't faded. With the release of their fifth album "N" just before the expo, the interest had grown even bigger. The band didn't disappoint their fans, but made room for several new songs in the set. When the band was announced on stage, the Factory's bottleneck between the merch stands and the concert area turned motionless and sweaty. 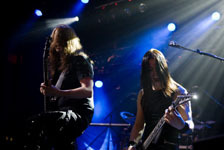 Seemed as though the whole Factory was dying to see Norther, and you couldn't blame them, this melodicly savage death crew following the footsteps of Children Of Bodom and the likes, are killers on stage. They don't bow down to anyone, not on stage. Their shows are endless reminders how shows should be pulled off, in their case meaning aggression, great musicianship and agile per formance. As great as they were on stage though, the Factory's response was as lame as wool socks on a birthday wrap. Maybe there just wasn't enough booze in the Factory or the service was too slow, or the crowd was too old or young. Whatever the reason the show was good, but the major downer and a sad fact is this genre hasn't released anything extraordinary in ages. But live is live and this quintet definately wasn't dead on stage. Having a large enough dose of aggressive metal for the rest of the year, RockUnited decided to withdraw at this point from the event and evening. Still to come was more aggressive acts, Stam1na, THE SCOURGER and Soilwork [photos above], and more in the vein of Turisas, Korpiklaani, who are an original folk metal clan also with accordion and humppa being their forte. And of course more clinics. 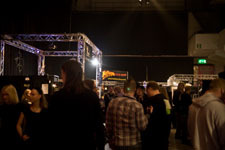 The event closed its doors each night at 2 am, but even that wasn't enough for some, who went on wondering in the Helsinki night for more booze and party. This year Factory surprised occasionally with good sounds, but moreso the old industrial halls are for partying. This years party was unfortunately on behalf of the crowd way too lame, the effort of having at least a decent party came mostly from bands. 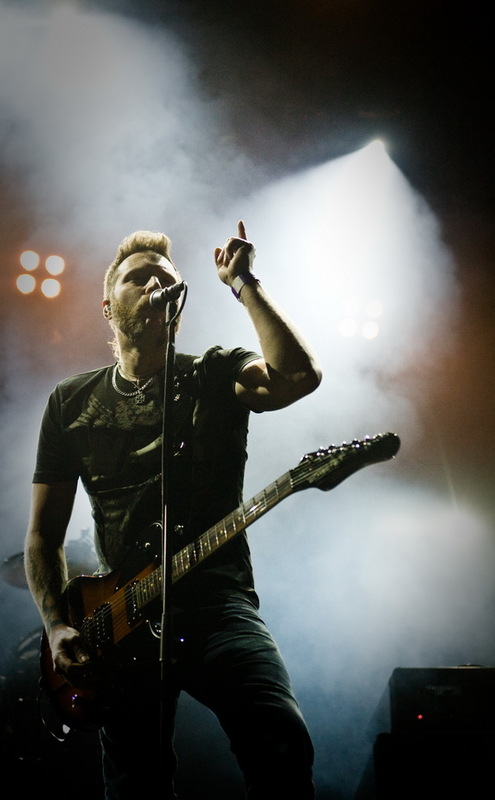 So rockfans, next year live a little and rock more! It's not a funeral, although this years bands are inspired by the gloomy territory of pre-and post death. You can count me in on the living!